The Project falls within the StartUp Europe Awards, an initiative with which the European Comission -DG Connect- and the Finnova Foundation aim to promote local entrepreneurship and open innovation. This initiative, open and inclusive, will promote a public collaboration – private for the UE-Mexican agro-food industry. CDI Corporative will promote the participation of new companies with innovative projects dealing with the Aggrotech, Social Innovation, Water, Climate and Gastronomic fields. The official announcement regarding the Water category, in the framework of the National Forum of Sustainable Development and Water, is released in Mazatlán, Sinaloa. Mexico, 31 August 2018. Mexico StartUp Europe Awards is an initiative in which the European Commission –DG CONNECT- and the Finnova Foundation, in collaboration with CDI Corporative (Corporativo de Desarrollo Integral) aiming to promote local entrepreneurship and open innovation for the UE-Mexican agro-food industry. Mexico occupies the eleventh position in the world in regards with exportation and the tenth position as a food producer; with this in mind, the incorporation of Mexico to new digital technologies, modernisation of business models and decision-making in order to increase its competitiveness on an international scale is a must. There is evidence of important advances around entrepreneurship in Mexico, however, the agro-food industry requires greater efforts in order to create an environment of emergent new technologies, innovations and agro-technologic businesses. “Mexico has an important potential in terms of Start-ups, as the conditions to accelerate the growth of this field by generating innovations and an entrepreneurship environment are already there; with this initiative we are looking for a coalition with key actors that can help to boost and reinforce an interinstitutional link with public inversions within the agro-food industry”, according to Marco Antonio Herrera Oropeza, General director of CDI. The Instituto Tecnológico y de Estudios Superiores de Monterrey has joined this initiative by considering its relevance as an enhancer of development in a field that is as fundamental for the Mexican economy as the agro-food industry. The Business School of this university strongly emphasizes the entrepreneurial culture and the connection between universities and companies as an instrument to promote economic and social development of all countries. The Finnova Foundation facilitates the collaboration between Mexican and European entities thanks to European Funds in order to technologically innovate, particularly the aggrotech sector, which is strategic for Mexico and, at the same time, it has a great commercial importance for the European Union. “StartUp Europe Awards is the vehicle allowing Start-ups, corporates and the public administration to deal with the challenges that may arise from the development of the programme Horizonte Europa, counting on 100 trillions for innovation until 2027, and Mexico should be a leader country in obtaining this subvention in cooperation with Europe” states Juan Manuel Revuelta, General Director of Finnova Foundation. CDI Corporative will implement the participation of new companies participating in innovative projects within the categories of Aggrotech, Social Innovation, Water, Climate and Gastronomy, so their services and products can be known at a global level. “We want this entrepreneurial environment to find and initiate business ideas and inversions so that producers can reach these innovations with the help of all the actors”, confirmed Marco Antonio Herrera Oropeza, General Director of CDI. Among the challenges that can be overcome with the help of the Start-ups are the improvement of the product chains, the valorisation of waste material, the reutilisation of water, the improvement of the food quality, the impact of the climate change, the renewable energies and the implementation of continuous and inclusive innovation culture. 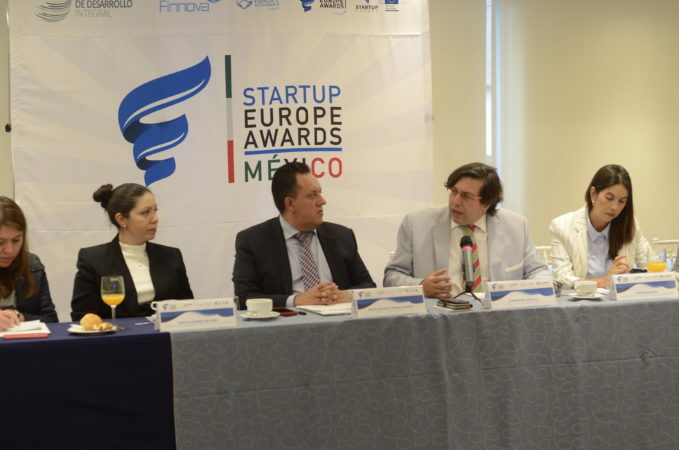 “StartUp Europe Awards also aims to promote business cooperation as a result of the free trade agreement negotiated between the European Union and Mexico, which introduces the possibility of accessing a market with more than 740 million people in Europe and 133 millions of Mexicans. At a geostrategic level, globalisation switches from a concentric model revolving around the United States to a new cooperation point such as the European Union – Latam, Finnova Foundation’s bet since 2010”, confirms Juan Manuel Revuelta, General Director of Finnova. About CDI Corporative: a holding with more than 10 years of experience in the agro-food industry which offers integral solutions for the public and private sectors. Its recent participation was focused on the strategic design of the Planeación Agrícola Nacional 2017 – 2030. About Finnova: a European Foundation with head offices in Belgium, Spain, Romania, Panama, Chile and Mexico. Promoter of innovative initiatives and platform for public and private entities headed towards the creation of innovative environments and the boost of Start-ups, relying on the supporting tools offered by the European Union.